blog post, featured, pishing scam, technology, yahoo, yahoo e-mail » Yahoo! 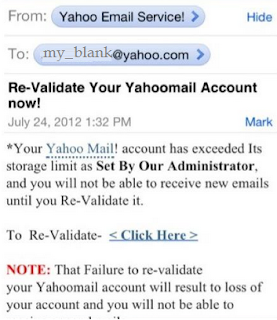 "E-Mail Account Exceeded Phishing Scam"
Beware of the message is not from Yahoo! “Your E-mail account has exceeded its limit and needs to be verified, if not verified within 24 hours, we shall suspend your account. Click Here,” The message is a phishing scam. Those who click the link in the message will be taken to a website which is cloned as a Yahoo site that requires user to log in with your password and username. Once the user logs in, all of the account log in information will be instantly stored in a database controlled by the cyber criminals. 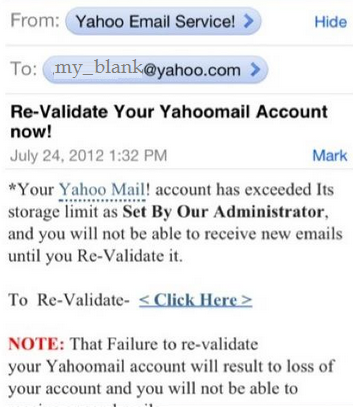 Yahoo discusses such phishing attempts on its website. If you receive an email from a web site or company urging you to provide confidential information, such as a password or Social Security number, you might be the target of a phishing scam. The tips below can help you avoid being taken in by phishers. Important: To be completely safe from phishers, do not click links in emails. If in doubt, close your browser, reopen it, and type the web address for the site you want to visit directly into the Address bar. So if you receive one of these phishing scam messages, do not click on any links or open any attachments that it may contain. This is a good reminder, that people should learn to think before they click. I guess it's safe to say that none of these big companies (Google, Yahoo, Facebook, etc) will ever email users to ask them to validate their accounts. Such a technique is always a scam. Yikes! Thanks for this update. I normally don't read mails..